The map shows where a 4.7-magnitude earthquake hit off the East Coast Tuesday, Jan. 15, about 136 miles from land. A minor earthquake shook off the East Coast on Tuesday evening, mainly felt along coastal Virginia and Maryland, as well as parts of Delaware. 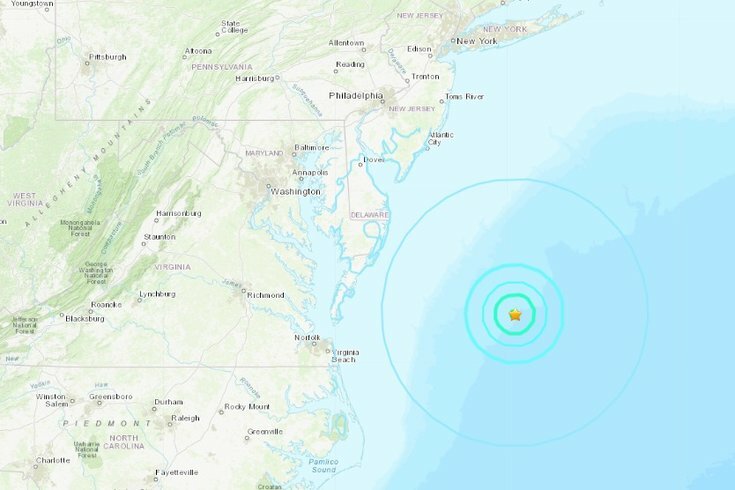 The 4.7-magnitude earthquake was about 136 miles off the coast of Maryland and began around 6:30. p.m., according to the U.S. Geological Survey, and yielded no reports of tsunami danger or other damage. Though there are no reports of the earthquake being felt as far north as New Jersey or Pennsylvania, some on social media reported feeling the earthquake from Delaware. About 30 people, predominantly in Maryland, Virginia, and Delaware, had reported feeling the earthquake within a couple hours of it occurring, according to USGS. Despite the potential for it to be felt along the East Coast, any actual damage caused by the earthquake is extremely unlikely. In the time it takes for the earthquake to travel from the ocean to the coastal area, the seismic waves would have greatly steadied. Tuesday's earthquake was felt far less compared to the last two major East Coast earthquakes in recent history. In 2017, a 4.1-magnitude earthquake hit about 10 miles northeast of Delaware. A 2011 earthquake at 5.8 magnitude struck the East Coast and was felt from Delmarva and as far north as Canada.